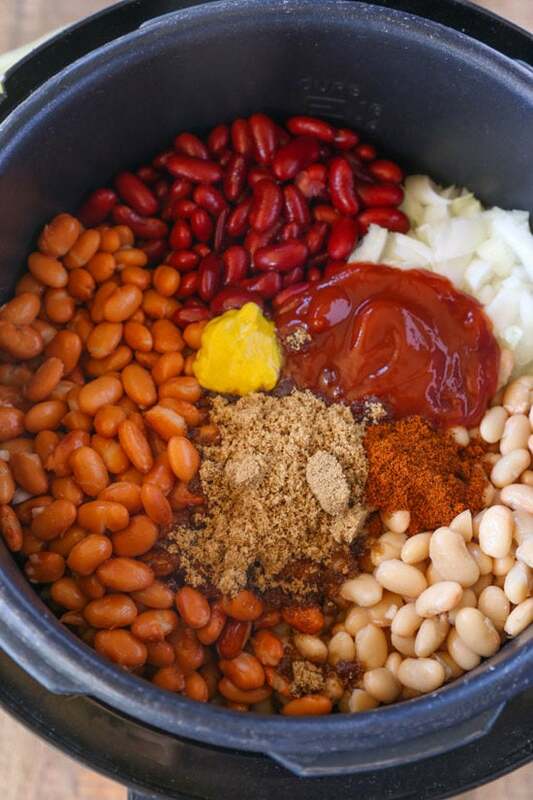 Instant Pot Brown Sugar Baked Beans are a quick and easy summer side dish thanks to the instant pot with all the hearty, filling, baked bean flavors you love. Slow cooker directions also provided. This month I’m sharing a delicious side dish recipe for all the warm weather we’re finally starting to see (except on the East Coast, they’re still getting snow!). Some of my favorite summer recipes include Deviled Egg Potato Salad, Rotisserie Roasted Potatoes, and Healthy Waldorf Chicken Salad; all three are delicious served during picnics or barbecues. Baked Beans are one of the most popular summer side dishes we all enjoy. For years to have a healthier option for baked beans I used to just try to find the healthiest canned variety I could find. The idea of making them from scratch with all the added sugars and the calories from the beans was overwhelming. 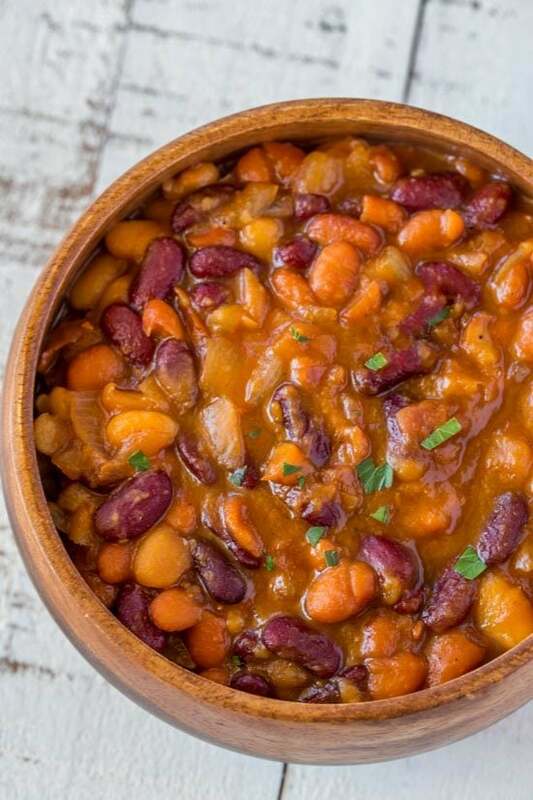 With the addition of beans to the zero points food list from Weight Watchers baked beans have once again become a side dish that you can enjoy without using a lot of your points. 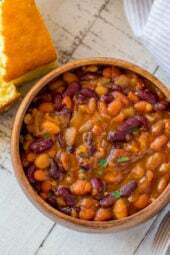 With a smaller amount of sugar and ketchup these baked beans won’t be too sweet, but just sweet enough satisfy all the cravings for the nostalgic flavors of baked beans that you love. We also use dark brown sugar in this recipe in place of adding molasses (this helps us keep the points down) and since we’re using the instant pot we don’t even have to pre-cook the onions in any oil. This is as easy as adding the ingredients and letting the machine do all the work for us! Add some spice with diced canned chilis or freshly chopped jalapeños. Add some smoky flavors with some chopped up bacon. Buffalo Turkey Cheeseburger with Blue Cheese Broccoli Slaw or Spicy Black Bean Burgers with Chipotle Mayonnaise are great burger ideas to serve along side the baked beans. Rainbow Potato Salad or Summer Potato Salad with Apples are great side dishes to add to your summer table. Preheat your oven to 350 degrees. In a cast iron skillet add 2 teaspoons of canola oil and the onions. Cook them until translucent on medium heat, about 4-5 minutes. Add in the rest of the ingredients and stir. Cover tightly and bake for 45 minutes. 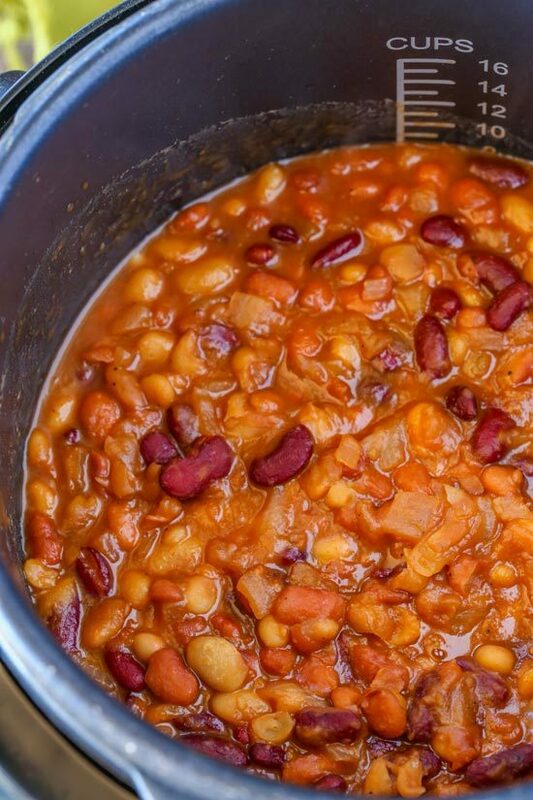 Instant Pot Brown Sugar Baked Beans are a quick and easy summer side dish thanks to the instant pot with all the hearty, filling, baked bean flavors you love. Add the ingredients to the insert and stir them together well. Place the lid and lock. Set to Manual, High pressure, and set for 8 minutes. Once finished, natural pressure for about 10-15 minutes, then quick release. Add the ingredients to the slow cooker and stir them together well. Cover and cook low 6 to 7 hours. Stir before serving. Pictured is a double recipe, but the ingredients are exactly the same ratio. If using dried beans, cook for 35 minutes. Super easy, has become a rotating side dish for all sorts of meals. Great recipe! Made them as a side for some BBQ pork and everyone loved them! So easy and definitely a keeper! Made them twice. Doubled the recipe the second time. Also just used navy and northern beans. Found them plenty sweet so next time decrease the sugar. Baked them in the oven. I followed the directions exactly. It tasted very good but was beans in flavored water basically. I expected it to be thicker… like a can of baked beans from the grocery store. Did anyone else have this problem? If so, how do I fix it next time? You could always put it on saute after pressure cooking to thicken it up a bit, or if using the slow cooker, let cook with the lid off for a little bit to thicken up. Loved this. It isn’t as cloyingly sweet as most baked beans.and we didn’t miss the bacon! I make this at least once a week. 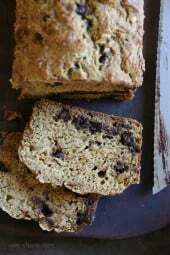 It is such an easy recipe, and the whole family loves it! Can this be cooked on high for a shorter amount of time in the slow cooker? I’m not a fan of kidney beans. What would you suggest as an alternative? I made the recipe exactly as stated (spicy brown mustard though). It came out perfect! Absolutely delicious! I may never go back to canned baked beans again! It was also ridiculously simple. I followed the recipe, put everything in my new instant pot and started it. Twice now, I have gotten the “burn” error message. I took the beans out and there was just a little bit stuck to the bottom of the pot so I scraped that off and tried again. I did notice that when I opened the pot to check, the beans look like they are all falling apart. The second time around I also got the burn error message. The pot doesn’t even get up to full pressure before I get the message. This time around, I added a little more liquid so I guess I’ll see what happens now. Maybe the third time will be a charm. If you double the recipe in the Instant Pot do you have to double the cooking time as well? So good! I made them at work for a meal train (a co-workers needs some meals) and I can hardly stand it! I helped myself to a cup… delish! I just got an instapot and it was the first thing I made. I got the burn message on my instapot after the first 8 minutes so opens it up and put in 2 cups of water. And now running. For another 15 min on low pressure. One question. I hope I understood this correctly. First run it on high for 8 min then low pressure for 16 right? I made these today for a family bbq and everyone wanted the recipe. I used black beans, navy beans and small pink beans plus spicy brown mustard and light brown sugar. Then I simmered them on top of the stove for an hour. Hi Gina! Can I make these on the stove? If so, for how long? I’m using dried beans and my slow cooker. So soak beans overnight then slow cooker recipe 8 hrs on low? These are really good. Icooked them in my slowcooker for 4 hours on high, and I added a bit of liquid smoke, and used them as a base for my poached eggs. Delicious and works really great with Weightwatchers. Thank you for your recipe. What is the time if I do slow cooker on high? Would a double batch fit in a 6Qt instant pot? I would think so. I made a triple batch and then some PLUS added 3 lbs of cooked turkey and it was just to the top of my 8qt. I have made these beans in my crock pot several times now. They are delicious and so easy! I did decrease the water to 1/2 C after the first time, in the crock pot I think that was enough added liquid. I have also used black beans in place of one of the other canned beans, any combination is fabulous. Even my husband who LOVES the sugar laden Bush beans is loving these, thanks! Looking forward to making this for a work BBQ! Can you tell me, have you ever doubled the recipe? Did it still fit in the 6qt IP ok? Thanks! Hi Gina! I made these last weekend and doubled the recipe and used more pinto and northern beans and omitted the kidney beans. I used Splenda blend for the brown sugar because we wanted them sweeter with no extra points. I don’t know if it was the ketchup or the mustard (or the Splenda brown sugar blend!) but I found it sort of acidic. I happily learned that one can stir in a teaspoon of baking soda to negate that acid taste. After the bubbling went down, I tasted again and added a little more and then it was just right. Great low point baked bean option! I’m sure you already know about the baking soda fix, but it was news to me! Thank you for your great recipes. I’m just learning to use my instant pot and I so appreciate your great instructions and cooking options. Can I double this recipe in my instant pot? If so, would I increase the time and by how much? These are so good, even my non bean loving husband enjoyed them. Not overly sweet liked the canned stuff… even better the next day! Currently eating a bowl of them cold because they are just as good as warmed up. Yummy, thank you!! Great recipe! Made these in my IP. I did chop up 3 slices center cut bacon and crisped them on sauté before adding the rest of the ingredients. I did not have dark brown sugar so I slightly decreased the regular brown sugar and added a tablespoon of molasses to compensate. Penzeys medium chili powder. So good! I am making these for an upcoming Memorial Day party. If I make a triple batch, do you think I’ll need to cook them longer in the Instant Pot? Time should stay the same. Loved this! Made it today. Just the perfect amount of sweet. Thanks, Gina! I add the bacon cooked or uncooked? Thank you! Did these almost exactly as in the recipe and my wife and I loved them. We added 0.5 lb 93% lean ground turkey sautéed at the beginning and I was doing other stuff and let the natural release go all the way at the end. Overall, I was pleasantly surprised by the amount of flavor, given how few ingredients the recipe has. 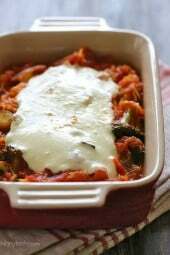 I loved this recipe, made it in the instant pot as written. I love baked beans but had given them up because of all the brown sugar. This is just right and I love the low points value. Thank you. Sounds delish but I DETEST mustard….can I substitute it with something else or if i leave it out will it still taste ok? Maybe balsamic vinegar for acidity. Definitely will make again. Actually tastes better once it’s been in the fridge a day or two! I just made these—they are delicious! Thank you Gina! I followed the instapot directions. Mine had a lot of liquid unlike canned baked beans, however, they taste soooo good! Definitely a new summer staple! These were delish, and much lower points than canned baked beans. I used kidney, white canellini and black beans. Added 1 jalapeno diced and 1 tbs of worchesterchire. Simmered on the stove for about one hour. Great side for BBQ night. These are so yummy Gina! Thank you! I made them in my slow cooker and they turned out perfectly saucy. The only change I made was using applewood rub seasoning instead if chili powder because I was out. I look forward to making them again. great, I will double check the points. It also came up 3 Fsp points in the WW App for me. Definitely points well spent! Delicious! I made these this week and they were amazing. Mine also came out to 3 points which is still fantastic. I chopped up a few lean, beef hot dogs and heated it up the next day. Even better as a leftover! I have missed baked beans but not anymore! Thank you Gina! I’ve got this in the slow cooker now! When I input this in the Weight Watchers recipe builder it comes up as 5 freestyle points. Am I missing something? I’d obviously prefer it be 2, but how did you come up with that number? I haven’t eaten baked beans in years because of the sugar and points. This recipe is delicious. I don’t have an instant pot so I sautéed the onions until soft and then baked everything in the oven for 45 minutes at 360 degrees. I could have bakedthem a little longer but my husband and I both loved them. Will make again especially during the summer months for barbecues. Gina, you’re a recipe genius! Super easy and delicious! Will definitely make again! Incredible! I have always loved baked beans but hate when they are sticky sweet. These were creamy and just sweet enough. I used extra northern in place of kidney because that’s what I had. I think next time I will make them from soaked beans. Sautéed two slices of chopped bacon in the pot before adding the other ingredients. Used half maple syrup half brown sugar and omitted the chili powder. I have a question on the dry beans note. Which method is the 35 minutes for? Assuming the Instant Pot, are we to add 35 minutes to the cook time or change the cook time to 35 minutes instead of 8? Is this recipe 2,4 or 6 WW points. 2 freestyle points or 4 points +. when I run this thru recipe builder on WW, it comes up with 5 points? I get 17 points in the recipe builder for 1/3 cup of dark brown sugar? 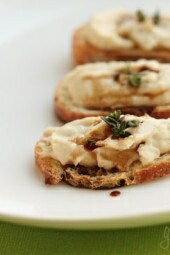 For me when I built this recipe in the WW app, it came out at 3 FSP. Yes, but they could be mushy when thawed. Hi Gina, I love love love your recipes!!! I entered the ingredients into MyFitnessPal and it’s giving me 207 cals/serving. Is there something I am missing? Turned out fantastic! Just the right amount of sweet. I turned my pot to sauté for a couple of minutes to thicken it up a bit, but it would have been great without it too. Brown sugar. 2 points. Sounds like a winner! I would like to make this in the oven or regular pot. What would be the time of cooking? Thank you so much. I love all your recipes. The oven directions are listed above. Is the 35 minute cook time for dry beans using soaked or unsoaked beans? I prefer to use dry beans instead of canned. What is the amount of dry beans that I should use? Thank you. Can you use agave instead of brown sugar? Not necessarily, I cook dry, unsoaked beans for 45 minutes. What is the points plus value on these? It’s not listed. I have not made the recipe but have had some experience with BURN notice on my instapot. I am unsure about the amount of liquid in this recipe. Too little liquid in recipe causes BURN notice to appear. I’m asking the same question as you, Donna., thanks. Concern is amount of sugar vs. liquid in Instant Pot, plus dumping catsup which has sugar in also? Sabrina, please let us know if the liquid amount is right? 6 to 7 hours low. Its a pressure cooker. You can also use any heavy oven safe skillet or Dutch oven. What do you mean by release the pressure and let it decrease? Once you quick release all the pressure is gone. Natural release then quick after 10 min. I’m going sugar-free for this year. Will the beans taste alright if I leave the sugar out? They won’t taste like baked beans as sugar is what makes them sweet but I am sure they will still be tasty. Have you tried the G. Hughes brand of BBQ Sauce? It’s sugar free and might give you that “sweet” taste you’re looking for. You can find it at Walmart. Why not try a small amount of Stevia rather than sucralose which is the sugar substitute in the BBQ sauce. I keep my sugar intake very low but I won’t use the fake stuff. Gina I cannot wait to try these. I miss good baked beans and your recipes never let me down! I was so excited to see this. Add maple syrup instead of sugar. Honey even. Try crushed or chunk pineapple. If I used a slow cooker, how long should I allow it to cook?